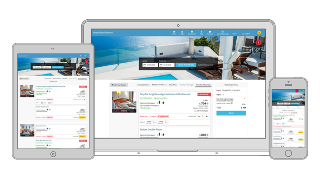 With RezEasy's integrated Booking Engine each booking from your website is instantly added to the database used by the Back Office and room inventory is updated in real time. The system auto-detects the visitor device and selects the appropriate interface for computer, tablet or smartphone. Unlimited number of rate codes and rate changes during the year. Several rate type to choose from, charge per room or per persons. Package your rooms with other products to create unique offerings. Select when these offers are available, the rooms types and number of persons per package. Translate the text and templates used by RezEasy into different languages, or ask us to do it for you (additional cost per language). Allow visitors to view prices, and optionally pay, in their own currency. RezEasy is pre-configured for many Payment Systems and you can allow visitors to choose from different payment methods (bank transfer, credit card and PayPal for example). Our own Transaction Manager module is included with RezEasy. RezEasy allows you to send automated pre-arrival and post-stay emails to your guests. You can customize the content and format of outgoing emails. Our optional two-way Channel Manager interface to Global Distribution Systems automates the export of rates and import of reservation made via Expedia, Booking.com and many others. Check out the custom designs and all of the features in RezEasy, you will be pleasantly surprised.